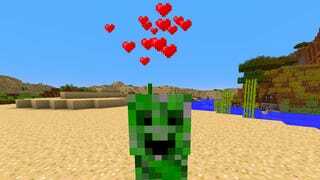 Included in the update are friendly Creepers who are, arguably, a lot more creepy now. That smile. Mojang just released a brand new development snapshot for the upcoming “1.10 Minecraft update” (they’re skipping 1.9, you see), and it’s absolutely filled to the brim with the kinds of things Minecraft players crave... like hearts, love and hugs. We have removed the ability to directly harm other creatures. You should be rewarded for helping, not hurting. Removed Health and Hunger. We feel that these are not appropriate gameplay mechanics for a game about love, sharing and peacefulness. Added a new “Love” meter. This fills up the more you help others, and others help you. “Survival” mode has been renamed to “Existence”. Bats are now 20% cuter. Squeek. Chickens can now be ridden by any player less than two blocks tall. Cows will now alert you to important events that you may have missed by means of an audible notification. Pigs can no longer fly, but can now climb on walls. Sheep will, if asked nicely, share their wool to keep you warm. Squid changed, but we’re still trying to figure out how or why. “Monsters” are no longer named as such. The preferred term is “Inhabitants”, as they live in this world just like you or me. Steve and Alex have realized that the inhabitants are not evil, and just want to hug and get along. Creepers no longer explode. They have gotten over their nervous disposition and are much more friendly once you get to know them. Skeletons have revealed themselves to be very efficient farmers, having a permanent source of bone meal on them at all times. Blazes are actually pretty cool guys and will defend you from harm. Guardians have put aside the initial misunderstanding, and now welcome you into their home with arms… erm… eyes… wide open. Ghasts are no longer frightened so easily, and will offer you rides throughout the nether. Slimes are now pretty fun to hang around with, sharing their secret jumping abilities to those that will listen. Witches are super friendly and surprisingly knowledgable. They will help you by sharing their potions. Zombies are extremely cuddly and love to hug. The Wither has been replaced with his lovable pink counterpart, promoting vitality and nourishment to the environment around him. Removed rain as it upset a lot of players. Falling snow has a chance to make exposed chests mysteriously full of goodies at midnight. Trading has been rebalanced. We felt that the previous incarnation wasn’t very fair, and believe the new system is a step towards helping fix this. Villagers will offer you help in picking up items or blocks, in exchange for a small fee for their services. Iron Golems can appear as a manifestation of the village’s love for you. Lava has been replaced with liquid cheese. It’s delicious and much safer! TNT has been replaced with a much friendlier block: A love bomb. As we no longer have a hunger system, food items now give Happiness instead of Saturation. Carrot on a Stick has been removed. It was just cruel to pigs and we are very sorry for this. Bows no longer require arrows. Shooting things makes them fall in love with the first thing they see. Dungeons have been replaced with homes, offering a much more inviting and comfortable experience for everybody. All caves have been checked by the Minecraft Safety Committee to ensure a safer experience for players. Desert temples no longer contain TNT traps, and come with a nice, safe way to access the bottom floor. Some cliff edges may be lined with fences to avoid accidents by the unwary traveller. Jungle temples are no longer trapped, containing instead a new rare Golden Creeper to reward exploration. Some potions such as Strength or Harming have been removed, as we no longer have a place for them in the game. Horses can no longer be ridden as this was deemed unfair to the horses. In compensation to the horses, they can now ride on your shoulders. Minecarts now have a fluffy pink interior. Added obsidian boats which are impossible to break. Ender pearls no longer transport you to the target, but instead the target to you. Added rain back as it soothed a lot of players. Not everybody had the same experience playing Minecraft under different configurations, so we decided to remove all the graphical settings. You may now only have one world, in order to reduce fragmentation and to treat all worlds as equals. Some resource packs were prettier than others, giving some players an unfair advantage in the amount of fun they were having. This has been fixed. The main menu is now greatly simplified, since there’s only one world available. Graphics settings? What graphics settings? Swords are Hearts now, to help facilitate the Happiness-based gameplay. Squids float gracefully through the air. Nether portals are much more inviting. The Nether itself didn’t change much, but Zombie Pigmen are a lot less threatening with their little heart wands.